MKV FSI or MK6 TSI? Thanks! I'm actually reading up on your TT-RS control arm busying DIY, another thing on my to-do list. I don't know why VW went with the softer bushings for the GTI, couldn't have been that much cheaper over the S3/TT-RS parts. The TSI makes maybe 10 lb-ft, 10 bhp at most over the FSI engine...not sure where that comment is coming from. I didn't buy it for speed, there are faster cars at the price, of which the mk6 isn't one of them. I really can't recommend that upgrade enough, it's fantastic. In hindsight if I could recommend approaching it any differently I would seriously consider just removing the entire control arm, which should make getting the bushing in place over the control arm a lot easier than the method I used. I was trying to be lazy and not have to remove the wheels and I think it ended up taking a lot more effort. Just a quick FYI...Dropping the control arms is easy if you have a manual trans. Apparently if you are DSG it's a huge PITA to remove the front control arm bolt on the trans side. The DSG trans housing is larger than 6MT and prevents you from pulling that bolt foward and out of the subframe. 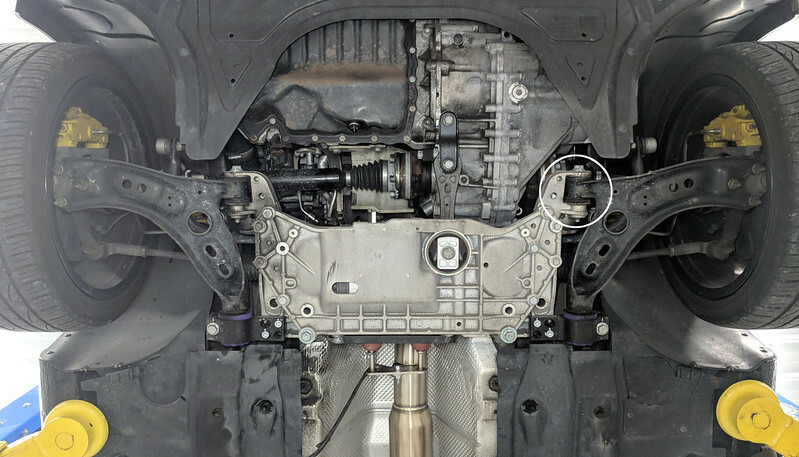 To gain the clearance needed to remove the bolt you have to disconnect the trans mount (maybe also the dogbone mount) and lift the engine/trans up a bit. Also worth noting that this bolt is a TTY bolt and should be replaced. Part #n10141003. Ahhh right, thanks for that. I remember reading about that bolt on DSG cars a while ago but it had slipped my mind.